Ibrahim AM, Lillemoe KD, Klingensmith ME, Dimick JB. Visual abstracts to disseminate research on social media: A prospective, case-control crossover study. Ann Surg. 2017. doi: 10.1097/SLA.0000000000002277. Nearly all major academic research journals have adopted social media platforms, such as Twitter, to disseminate their publications and make them more accessible to readers. One recent study suggested that articles featured on Twitter may be 3 times more likely to be read versus those that were not. Despite the widespread adoption of Twitter by academic journals, the extent to which the social media platforms and strategies can influence practical outcomes, such as number of article reads, remain understudied. 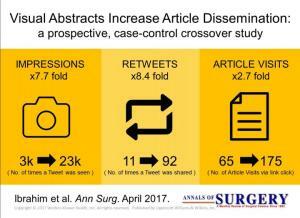 In July of 2016, Annals of Surgery adopted the use of ‘‘visual abstracts’’ as a novel strategy to improve dissemination of the journal’s publications. A visual abstract is simply a visual representation of the key findings typically found in the abstract portion of an article. They are produced by the journal after an article is accepted. Examples can be found in Figure 1. As of March 2017, more than 15 journals have utilized visual abstracts in their social media dissemination strategy, yet no data exist describing how their use impacts dissemination of publications. In this context, a case-control crossover study was conducted to compare tweets that included only the title of the article versus tweets that contain the title and a visual abstract. Such information would be valuable to help journals and authors understand the impact of different dissemination strategies for their publications.